Is there stopping Real Madrid in the UEFA Champions League? A third successive title, four in five years, and 13th overall. Real are flying at the moment. The 3-1 win against Liverpool at Kiev in the final of the 2017-18 edition capped off another brilliant European season. In the heart of the victory was Gareth Bale, who came on as a substitute and scored a brace, which ended up as the difference on the night. What was the pivotal moment in the game was his first strike. The acrobatic bicycle kick from a Marcelo cross is already being touted as one of the best goals ever scored in the Champions League final. That in turn saw talisman Cristiano Ronaldo admire the strike while watching it on the giant screen, after hugging Bale for the wonder goal. He had himself scored a similar goal against Juventus in the quarter-finals. Ronaldo wasn’t the only one left stunned, but English legend Rio Ferdinand was also equally stupefied. He congratulated Bale and admired his audacity to produce such brilliance in a final of the Champions League. Real manager Zinedine Zidane has himself been in the thick of things as a player, and now, as a coach, he couldn’t hide his emotions. The Frenchman showed a fabulous reaction, and one may wonder whether he remembered his 2002 heroics for Real. The three-time UCL winner as a manager – Zidane had his hand on his head as he looked at the bench and kept waving his hand with disbelief. 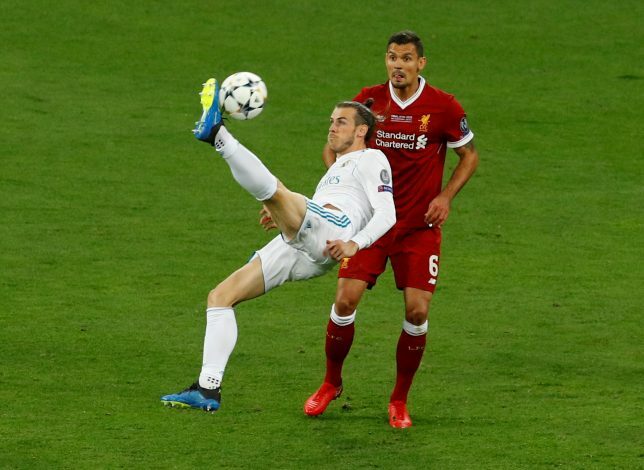 Bale went on to score another with a powerful strike, as Liverpool goalkeeper Loris Karius had a shocker of a night. The performance by the Welshman could go on to quash the rumours stating he is set to leave Real in the summer.